Outlier detection has numerous applications in different domains. A family of techniques, called contextual outlier detectors, are based on a single, user-specified demarcation of data attributes into indicators and contexts. 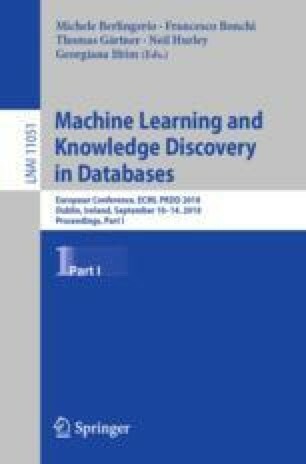 In this work, we propose ConOut, a new contextual outlier detection technique that leverages multiple contexts that are automatically identified. Importantly, ConOut is a one-click algorithm—it does not require any user-specified (hyper)parameters. Through experiments on various real-world data sets, we show that ConOut outperforms existing baselines in detection accuracy. Further, we motivate and apply ConOut to the advertisement domain to identify fraudulent publishers, where ConOut not only improves detection but also provides statistically significant revenue gains to advertisers: a minimum of 57% compared to a naïve fraud detector; and \(\sim \)20% in revenue gains as well as \(\sim \)34% in mean average precision compared to its nearest competitor. Code related to this paper is available at: https://github.com/meghanathmacha/ConOut, https://cmuconout.github.io/. This research is sponsored by Adobe University Marketing Research Award, NSF CAREER 1452425 and IIS 1408287. Any conclusions expressed in this material do not necessarily reflect the views expressed by the funding parties.